Renewed diplomatic negotiations must also include an implicit threat of increased sanctions if talks drag on. 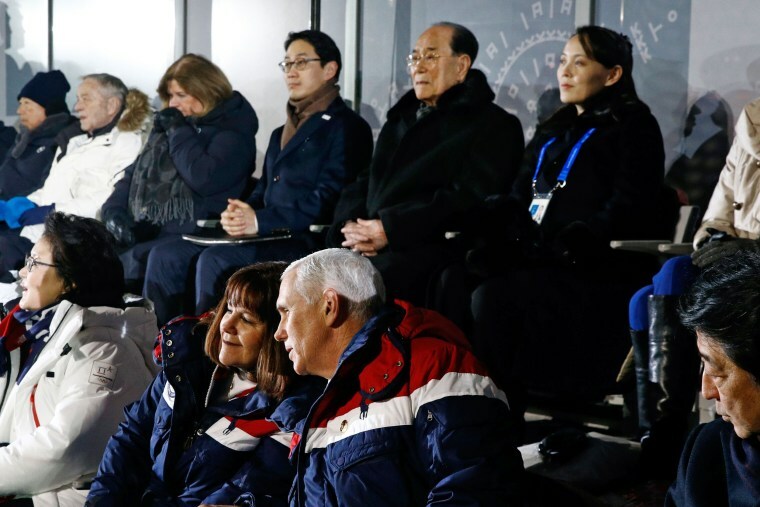 Flying back from the Winter Olympics in Pyongchang, South Korea, Vice President Mike Pence enunciated to a Washington Post reporter a potential emerging U.S.-South Korean strategy towards North Korea: “maximum pressure and engagement at the same time.” It is unclear whether the vice president’s statement signals a new U.S. policy aimed at eliminating North Korea’s nuclear and missile programs. But it should be. It’s the only course that could manage and hopefully eliminate the danger North Korea poses to the United States, its allies and the world. Indeed, that challenging balance — of staying firm while negotiating — should have been the U.S. approach years ago, and certainly from day one of the Trump administration. Having said that, if adopted, such a strategy will be as hard as ever to implement. We can expect resistance not only from North Korea and China, but also from Russia. The United States, along with Japan and South Korea, must maintain discipline on sanctions and be prepared to ratchet them up if diplomacy stalls. Over the last 20-plus years, the United States and its allies have applied pressure and then engaged in a fruitless repetitive cycle as Pyongyang pocketed food assistance, was added and then removed from the state sponsors of terrorism list (North Korea was added to the list again in 2017), and enjoyed sanctions relief — all for the simple act of returning to the negotiating table. This dynamic so frustrated former President Barack Obama and his Japanese and South Korean counterparts that they put a halt to the process altogether. Over the last 20-plus years, the United States and its allies have applied pressure and then engaged in a fruitless repetitive cycle. Meanwhile Kim Jong Un, after coming to power in 2011, has found the remaining international pressure bearable and proceeded with his nuclear and missile programs. Along the way, an acceleration occurred, alarming the outgoing Obama administration. President Donald Trump took one look at this brush fire and declared it a vast, raging forest fire. His shocking verbal overreaction — threatening U.S. “fire and fury” — yielded to a significantly strengthened international sanctions regime. This was augmented over recent weeks by rumors of a “preventative” strike on North Korea’s nuclear and missile facilities. In this context, diplomacy was deemed a next, rather than parallel, step. It would come only after North Korea demonstrated it would relinquish its nuclear program, Kim Jong Un's ultimate deterrent against regime change. The Pence formulation now implicitly acknowledges the reality that denuclearization is not a pre-condition to, but a result of diplomacy. The trick will be to maintain sanctions enforcement, along with the ability to tighten or increase them, as we begin to negotiate with Pyongyang. North Korean officials will argue they have earned a sanctions reprieve merely by talking. The Chinese may agree. The Russians certainly will. Russian President Vladimir Putin has already offered vocal — and materlal — support for the North Korean regime on the issue of sanctions. In part, this reflects their anger over international sanctions placed on them and the state entities they control. In September of 2017, Putin reportedly told South Korean President Moon Jae-in that sanctions would not work. The North Korean government, he averred, had learned from Saddam Hussein’s example that the only way to safeguard against regime change is through nuclear deterrence. Moscow has also actively worked to ease the pressure on Pyongyang, illicitly supplying fuel to North Korea. Last year, European security sources reported Russian tankers had transferred fuel at sea to North Korean vessels at least three times. A senior Treasury official also told members of Congress in September that Russia had provided coal to North Korea. These acts prompted a singular criticism in January from Trump. "Russia is not helping us at all with North Korea," Trump told Reuters, adding that where China has improved its enforcement, Russia has stepped in to ease the impact. The Kremlin also successfully pushed in the last round of U.N. negotiations on sanctions for a long phase-out for North Korean guest workers to leave Russia. The next test for the new Pence approach will be impending Treasury sanctions pursuant to the Countering America’s Adversaries Through Sanctions Act (CAATSA) passed last year. Implementing these sanctions may also put the squeeze on Russia. Treasury Assistant Secretary for Terrorist Financing Marshall Billingslea told members of Congress in September that North Korean bank representatives are still permitted to operate in Russia, a violation of U.N. sanctions. North Korean bank representatives are still reportedly permitted to operate in Russia, a violation of U.N. sanctions. Ultimately, it will require a concerted diplomatic effort to keep China and Russia from using new diplomatic efforts from South Korea or the United States as an excuse to relax their implementation of existing sanctions. This will be more likely if Pyongyang also opts to hold off on new missile or nuclear tests. Indeed, over time sanctions compliance will weaken, only incentivizing North Korea to talk on — and on. For this reason, maximum pressure must ideally include an implicit threat of increased sanctions if no diplomatic progress is made. Some sort of deadline for progress must be established at the outset. President Moon reportedly reassured Pence that he would resist holding “talks for talks sake.” But so long as maximum pressure is maintained and increased if necessary, having initial talks for talks sake will do no harm. Indeed, it will take the fire out of our fury, hopefully leaving a rational, resolute and unified front against North Korea’s nuclear and missile programs. Evelyn N. Farkas, a senior fellow at the Atlantic Council, is a former deputy assistant secretary of defense for Russia/Ukraine Eurasia during the Barack Obama administration and former Executive Director of the Graham-Talent Commission on the Prevention of WMD Proliferation and Terrorism. Prior to that, she was a senior fellow at the American Security Project, and Executive Director of the Commission on the Prevention of Weapons of Mass Destruction Proliferation and Terrorism. From April 2001 to April 2008, she served as a Professional Staff Member of the Senate Armed Services Committee on Asia Pacific, Western Hemisphere, Special Operations Command, peace and stability operations, combatting terrorism, counternarcotics, homeland defense, and export control policy.